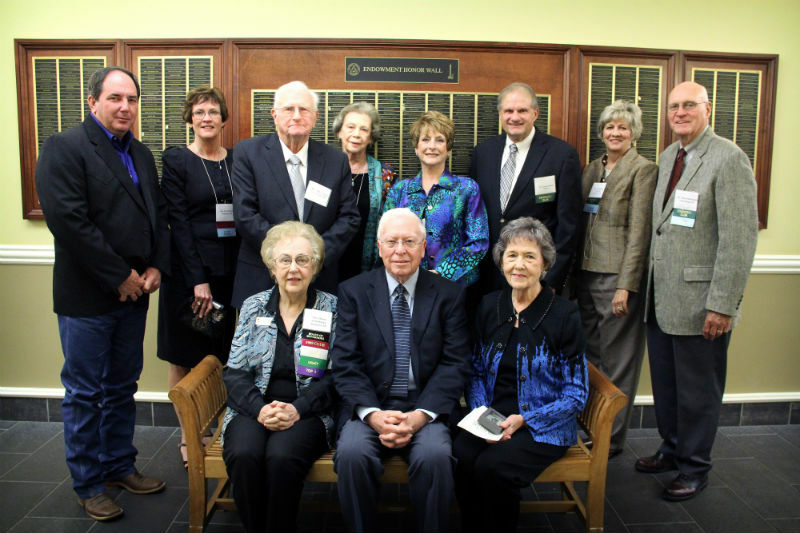 Back, standing: Rusty Hayes ‘83, Pam Murphy , William L and Dorothy Craig ’56, Neva and Dr. Claude Baker, Linda and James Martindale ’65, ’65. Credit Card Memorial Scholarship Endowment for a student who is a member of the SAU Rodeo Team. It was established in memory of Shawn Smith’s horse Credit Card by Jay and Shelly Smith, Rusty Hayes, and many other supporters of the SAU Rodeo Team. David Benoit Dugal Scholarship Endowment for a student majoring in English or Literature from the Mt. Holly community. It was established by David Benoit Dugal Estate. Major Lawrence E. Jarnagin Scholarship Endowment for a student graduating from Lafayette County Public Schools. The scholarship was stablished by James Jarnagin Estate. Esther and Linda Samuel Martindale Scholarship Endowment for a student majoring in Elementary Education. Recipients will alternate between Norphlet and Magnolia. Established by James and Linda Marindale and Adrin and Nancy Hargett. Georgie D. Mason Scholarship Endowment for a student in the SAU Nursing Program. The scholarship endowment was stablished by Ruble Mason. Charlotte Jordan Miller and Gertrude Jordan Summer Library Endowment to benefit Magale Library. The scholarship was established by Sharon Lee Miller Eichenberger. Endowed funds are the foundation for everything SAU must do: Recruit the best students and faculty and provide enhancements for departments, schools and colleges. Endowments provide a continual source of funds for scholarships, academic enrichment, athletic programs, and campus needs. Endowments are a wonderful way to honor a family member, a favorite teacher, or special person. Universities are graded by the size of their endowment because it is a measure of institutional health and helps measure the value that donors place on the institution. Call the SAU Foundation at (877) 235-4078 for more information on beginning your endowment at SAU.